Characterized by a sense of awe, these prayers are a constant reminder that we are standing before the King of the Universe. Rosh Hashanah and Yom Kippur are holidays for which intense and lengthy liturgical prayers have been written. These days (and the days in between) are known as the High Holy Days. In Hebrew, they are called Yamim Nora'im, which means "Fearsome Days" or "Days of Awe." While the three pilgrimage festivals (Passover, Shavuot and Sukkot) are characterized by great rejoicing, the High Holy Days carry a very different range of emotion. Beginning on Rosh Hashanah, solemn introspection is combined with resolve and hopefulness; by Yom Kippur, the mood has turned to penitence and utter dependence upon God. These ten days are traditionally characterized by a sense of awe and trepidation—a constant acknowledgment that we are standing before the King of the Universe. This time is understood as a time of judgment for the coming year. The High Holy Day prayers follow the same Jewish liturgical structure as weekday, Sabbath and festival prayers. However, there are many significant features of and additions to these prayers, which will be examined in this article. Perhaps the most unique feature of the holiday prayers that sets them apart from those prayed the rest of the year is that they contain piyyutim, which are liturgical poems meant to embellish these prayers. On Rosh Hashanah and Yom Kippur, piyyutim constitute very substantial portions of the daily prayer services. Let us look at some of the unique stanzas and thoughts behind the High Holy Day prayers. The Hebrew name Rosh Hashanah literally means "head of the year," but is known in the Torah as Yom Teru'ah1 ("A Day of Blasting") and Zikaron Teru'ah2 ("A Remembrance of Blasting"). The predominant message of the Rosh Hashanah prayers is the acknowledgment and acceptance of God as King over the entire world. A secondary theme is the inception of a new year, with the hope and plea that it will bring blessing, goodness and peace. Regret over misdeeds is more felt than expressed on this day, and we often find it difficult to understand why we should be judged favorably and rewarded with another good year. While the prayer describes the utter frailty and transience of man—and the fear one in judgment should feel—it also acknowledges God's supreme mercy, stating that a change of heart and life will overturn even the most severe decree of punishment. On Rosh Hashanah, the particular blessing of the Amidah that acknowledges God's holiness is expanded with an additional prayer that brings the era of redemption in successive stages: a) acknowledgement and fear of God's sovereignty; b) fulfillment of the redemptive promises, including the restoration of Jerusalem and the coming of the Messiah, and; c) the gladdening of the righteous, as evil is eliminated from the earth. At this time, God's kingship will be fully manifest. The prayer repeats the phrase uvechen (ובכן), meaning "and thus," several times, which is an allusion to Esther 4:16: "And thus, I will come before the king..." Queen Esther came before the king to plead for the salvation of her people, even though she had no legal right to do so. Likewise, Israel boldly prays to God for salvation, relying only upon God's mercy. On weekly Sabbaths and other holidays, the Amidah normally consists of seven blessings, in which the central blessing focuses on the sanctity of that particular time. During the mussaf 6 service of Rosh Hashanah; however, there are three central blessings instead of one, increasing the total number of blessings to nine. 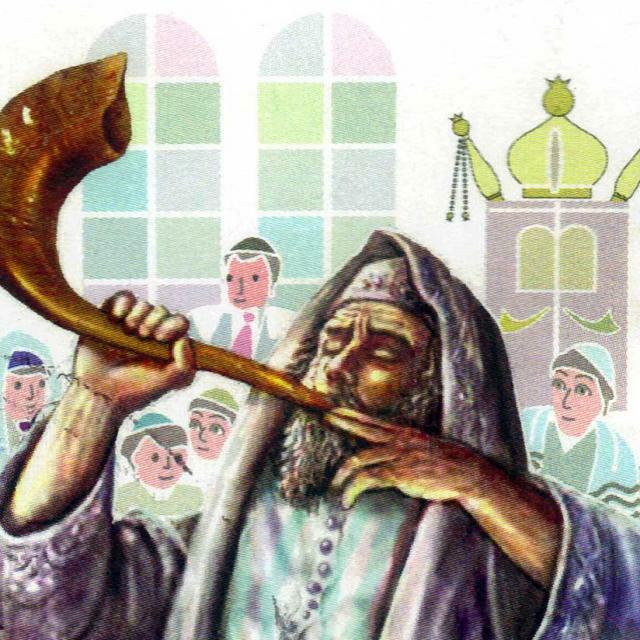 The three blessings are "Kingdoms," "Remembrances" and "Shofars." Each blessing contains a sequence of ten verses that focus on the theme of the blessing: three from the Torah, three from the Writings, three from the Prophets, and an additional final verse from the Torah. 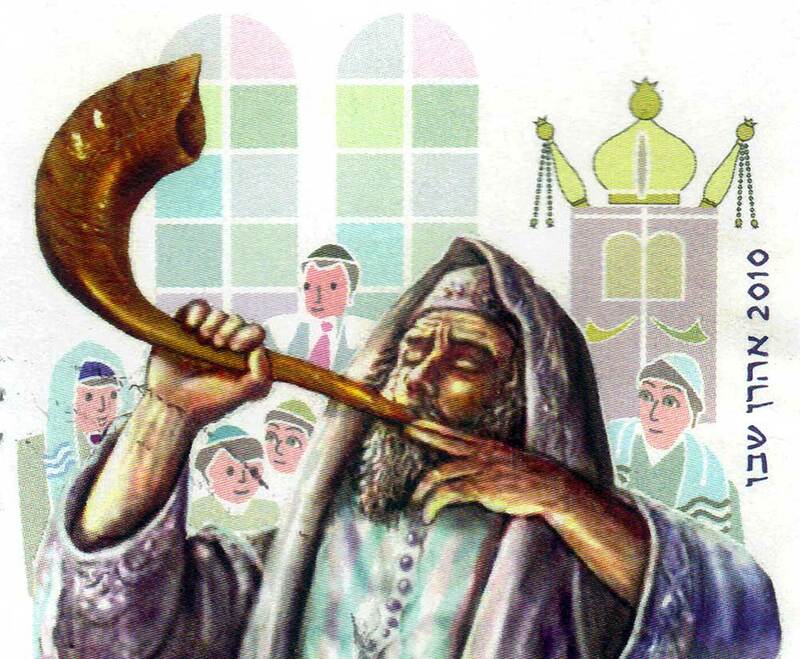 At the end of each blessing, the shofar is blasted a number of times. The "Kingdoms" blessing is an expanded edition of the Aleinu prayer, which declares the supremacy of God's kingship and the eventual elimination of idolatry from the earth. The "Remembrances" blessing requests that God remember the covenants that He has made, and focus on the faithfulness of Abraham in offering his son Isaac to God. The "Shofars" blessing begins by describing the giving of the Torah on Mount Sinai, which was accompanied by the blast of a loud shofar. It concludes by describing the blast of the Great Shofar at the Messiah's coming, when Israel will be gathered back to the land. Yom Kippur is recorded in Hebrew in the Torah as Yom Hakippurim, "the Day of the Atonements." While the ancient Temple services focused on the intercession of the high priest on behalf of the entire nation, the synagogue prayers are more focused on the individual as a member of Israel. Repentance is the central focus as worshipers confess their sins to God and ask for forgiveness with contrition and urgency. Blessed is the name of the glory of His kingdom forever and ever. On all other days of the year, this inserted second line of the Shema is read quietly. However, on Yom Kippur, this line is proclaimed aloud! The Mishnah records that in the days of the Second Temple, the High Priest would actually pronounce the sacred name of God when he confessed sins in the hearing of the people on Yom Kippur. (This name of God is usually not pronounced as it is written because of its holiness.) Upon hearing that name aloud, all worshipers present fell on their faces, proclaiming "Blessed is the name..." in response to the extreme sanctity of that moment. In the world today, God's kingship is not readily apparent. This corresponds with the daily recital of this line in a hushed tone. Yom Kippur reminds us of the day to come when God's sovereignty is unmistakable, and so we recite the line aloud. And do not disregard our offering, since we are not so obstinate or stiff-necked to say before You, "O Lord our God and God of our fathers, that we are righteous and have not sinned, but we and our fathers have sinned." The Lord, He is God! Yom Kippur prayers are further unique because, in addition to the prayer services found on every Sabbath and holiday (ma'ariv, shacharit, mussaf and minchah), a fifth and final prayer time is added at the last moment before Yom Kippur ends. This final service is called the Ne'ilah, which means "closing," and it is said to correspond with both the closing of the Temple gates in the evening and the closing of the gates of heaven as Yom Kippur draws to an end. A final, long blast of the shofar signals that the Day of Atonement is over. The traditional solemn and desperate nature of the High Holy Days can be mistaken for uncertainty about whether or not one can be made right with God. On the contrary, this day is meant to bring mere recognition that in order to maintain a healthy relationship with our Father in Heaven, mankind must feel sincere regret over our sins and take initiative to confess our wrongdoing and make changes. Furthermore, repentance, confession of sins and prayer for forgiveness are completely consistent with the message of the Gospel—they are at its very core. The Amidah prayer is known as the "Standing Prayer" and is prayed traditionally prayed three times a day by the devout Jew. The Amidah is comprised of various stanzas of blessing, thanks and petition. Compare Exodus 32:32-33 and Isaiah 4:3. The mussaf service usually follows the regular prayer services, but offers extra prayers for those who desire to continue praying for a longer period of time. Mussaf is a Hebrew word derived from the root, "to add." Adapted from: Messiah Magazine #97, written by Aaron Eby.